Swordfish are also known as Broadbills. 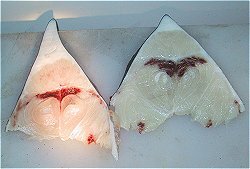 IDENTIFYING FEATURES: Swordfish have no pelvic fins. There is one keel on each side of their caudal peduncle. The two dorsal fins are widely separated in adults but continuous in juveniles. There are no scales on the body of adult Swordfish. They have a long, flattened bill. COMPARISONS: Adults resemble Marlins in general appearance, but have a quite different bill shape and fin arrangement. 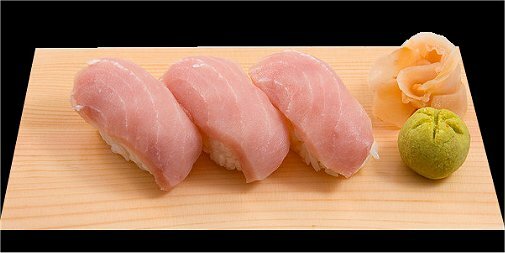 FILLETS: Swordfish are too large for filleting and are instead usually sold as steaks or cutlets. Their flesh is pale to pinkish and the texture of the flesh is comparatively fine. HABITAT: Swordfish live in a marine habitat and they are nomadic in the open ocean. They are thought to migrate to the surface at night to feed and mainly descend to depths of 600 meters or so during the day. Taste, Texture medium taste, firm texture. Highly prized. 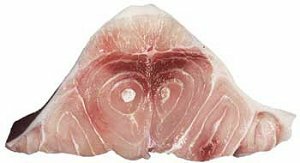 Steaks: 60% from headed and gutted striped marlin and 70% from headed and gutted swordfish. 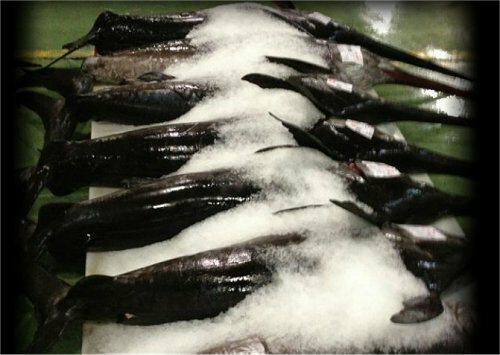 Swordfish has a higher recovery rate than striped marlin because it is often sold skin on and the belly flap is kept.